It’s a spacecraft the size of a shoebox, and, if all goes well, it will launch on a voyage to the moon in about two years. NASA greenlit the LunaH-Map mission two years ago. It’s the first NASA mission for Arizona State University’s School of Earth and Space Exploration. It’s going to look for ice on the moon, which can be used for water or fuel in the push to Mars. It’s a lot of firsts. First deep-space cubesat mission. First test case for sending lots of little spacecraft tagging along on a big mission. First time NASA — a famously risk-averse organization — has said, “Go low cost and high risk.” And it’s the first interplanetary spacecraft built on ASU’s campus — one of only seven institutions in the U.S. where that is possible. This past summer, LunaH-Map passed a huge milestone: a critical design review from NASA, an in-depth technical review to ensure a system can proceed into reality from plans and can meet stated performance requirements within cost, schedule and risk. For principal investigator (PI) Craig Hardgrove and his team of engineers and scientists, proceeding into reality from plans is nerve-wracking beyond belief. Hardgrove said people have told him, “If you’re not terrified every day, you’re not doing something genuinely new.” A NASA official told him it’s pretty much standard operating procedure for a first-time principal investigator to go through the meat grinder. In some ways, this mission is a return to the early days of the space program, where no one knew what would work and what wouldn’t. It’s an exercise in budget and risk. How cheaply, both in terms of material and manpower, can you gather information from space? There is no space on the spacecraft. Cubesats are miniature satellites (in this case a spacecraft) built to a standardized size and volume. One unit is about the size of a large Rubik’s cube. LunaH-Map will be the size of six of those put together — a 6u, in space-systems terminology. People also have to get their hands in it to assemble it. All the components on the 3-D-printed model fit together. But they have to be wired together too. And wires take up room. Savannah Puckett is a software and hardware test engineer with AZ Space Technologies, a company specializing in design and manufacture of instrument and spacecraft avionics and software, which is contracted to help build LunaH-Map. She is also an ASU computer science grad. There are roughly 200 wires in the harness. They have to fit into a few centimeters on top of all the hardware. Bear in mind this is not like cramming speaker wire and HDMI cables behind your stereo receiver so they’re out of sight. Puckett’s job makes building a Swiss watch look simple. All of the components need to work, and none of them can interfere with one another. “I think working on a watch would be a little bit easier,” she said. After launching, the rocket will drop off the cubesat about halfway to the moon. It will take LunaH-Map 70 days to reach the moon, using momentum from the rocket while making minor course corrections. It will then begin a very slow descent to its final orbit around the moon. It will fly about 10 kilometers above the surface — unusually low for a spacecraft — and it will take 470 days to reach that altitude. It’s not the Millennium Falcon. The propulsion system provides about a quarter- to a half-ounce of thrust. That’s as much force as dropping a sheet of paper on your hand. Aerospace engineer Joe DuBois is the structure design lead and integration and test lead on the team. One of the keys to making this mission a success from an engineering standpoint is cutting as much as possible from the vehicle. They ditched the idea of putting a camera on it a long time ago. It took up too much space and wasn’t absolutely essential. Usually functions like command, data handling and guidance and navigation control are huge on spacecraft so they can include as many instruments as possible. Not on this one, DuBois said. Weight is a factor everyone is keeping an eye on. The limit is 14 kilograms, just under 31 pounds. Southwest Airlines allows you more weight than that. Each component has to come in within its mass budget. “We are relying on the great work done by our component suppliers to be able to accomplish the challenging requirements,” DuBois said. Suppliers are treading new ground too. For example, a company called Radiation Monitoring Devices is making the neutron detector that will sniff for ice. The company makes devices like dirty-bomb detection equipment for the military, but it has never made a detector that has to a) fit in a really tiny space and b) fly in deep space. That’s pretty much the mantra for all the suppliers: We’ve never made one this small! We’ve never made one to go into space! Another issue is a mission operations system that works with NASA’s Deep Space Network, three communications facilities around the world that act something like air-traffic control for everything American in space. “Traditionally these systems are for hundreds of millions of dollars spacecraft,” DuBois said. Teri Crain is project manager. A scientist’s daughter, she has spent her whole life around huge science projects of one kind or another. This is her first NASA mission, however. She works directly with Hardgrove, team members and mission subcontractors to plan and schedule the project requirements to meet NASA’s expectations, all the while staying on budget. 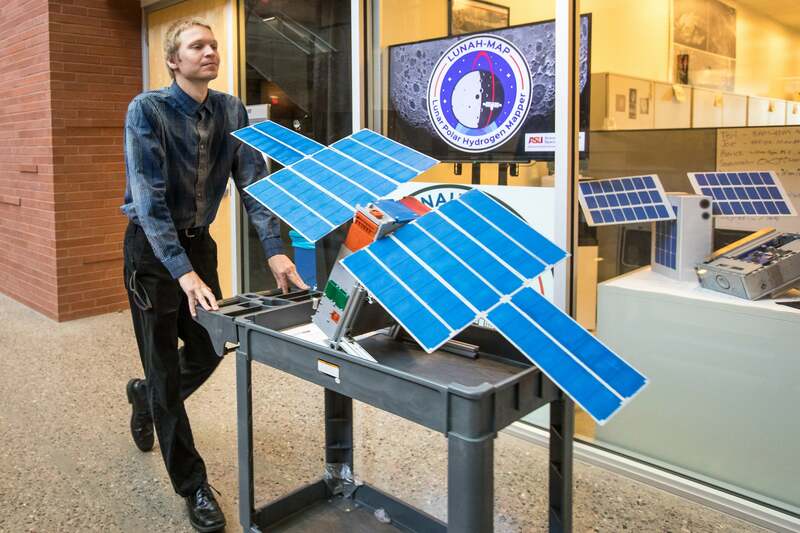 “Unofficially, I do whatever it takes to appease the masses — from relentless cat herding for meetings and planning of our critical NASA reviews to furnishing and maintaining our lab space and clean room as we prepare to build, test and deliver our cubesat to Tyvak,” Crain said. Tyvak builds custom satellites, contracts launches and provides launch integration services. The latter means they load stuff on to rockets and make sure it works. NASA intends the 2019 launch to be the maiden voyage of its new Space Launch System, a beast of a rocket envisioned as the Mars workhorse. The SLS is experiencing rocky times, according to industry buzz. Integration and Test is where you come down from the stratosphere and start thinking about how everything is actually going to work. Integration and testing training is coming up. What are clean-room procedures? What software and hardware will they need to assemble the spacecraft? What materials will they need? What tests will they do? There’s no blueprint for any of this, and it’s not like you can run down to Ace Hardware for something you suddenly need. For instance: how to get hands inside the tiny spacecraft to assemble it. Puckett has cooked up a test plan for that problem. RJ Amzler’s job will come into play at that point. He is the Flat Sat systems engineer. Flat Sat is a bunch of boxes laid out on a table that mimic the spacecraft and allow the team to understand how it’s functioning and whether the flight hardware they receive is acting properly. The boxes-on-a-table example is literal. When the flight hardware begins trickling in during November, the team will lay it all out on a table, connect it and run programs that check to see if it’s all working properly. “Any spacecraft is going to have problems with interfaces, but the work of Savannah got rid of a lot of those problems,” Amzler said. “That’s totally possible, and I think that’s something they’re looking for new missions like ours on every launch in the future,” Hardgrove said. “ASU is leading the way in small interplanetary science,” DuBois said.